Fashion Polish: Lush Lacquer Pink Panther & Color Me Gray... And a SALE! Lush Lacquer Pink Panther & Color Me Gray... And a SALE! Two posts in one day is VERY unusual for me but my girl Katie at Harlow & Co is having a Lush Lacquer sale and of course I had to share with you the promo code and a few swatches! Pink Panther is a gorgeous mix of pink, white and black hex glitter in a clear base. The glitters come in various sizes and there are also a few pink ones with a stripes/grid pattern. I love those! I used one coat of Pink Panther over OPI Pink Friday here and I love this color combination. Pink without being too girly LOL. Apart from a little bit of "fishing" for the larger glitters, I had no issue whatsoever, quite the contrary. 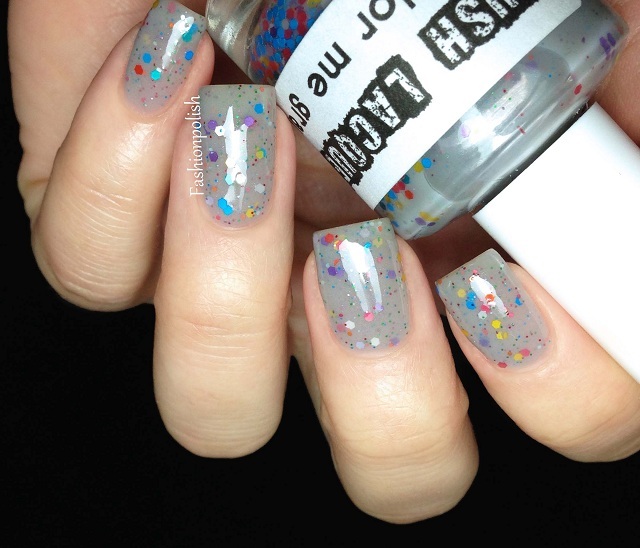 Color Me Gray is a pastel grey jelly with a fun mix of small and medium multicolored glitter. I must confess that I wasn't totally convinced with it at first but once on my nails, it definitely grew on me. I think I'm falling in love with jelly glitters... You're looking at 3 very thin coats of Color Me Gray plus topcoat, no underwear. How soft is this? You can grab these on Harlow & Co (free international shipping for all orders over $50). I just got Pink Panther, and I am SO excited to try it--it looks beautiful on you! Totally kicking myself now for not getting Color Me Gray with it. It really builds up beautifully, and I love those colours!! These are both really nice. Beautuful swatches I need color me gray! Oooo - I am loving Color Me Gray! Beautiful shots as always.